In July 2015, the Australian government announced a “war on feral cats,“ with the intention of killing over two million felines by 2020. The threat abatement plan to enforce this policy includes a mix of shooting, trapping and a reputedly “humane” poison. Some conservationists in Australia are hailing this as an important step toward the re-wilding of Australia’s outback, or the idea of restoring the continent’s biodiversity to its state prior to European contact. Momentum has also been building in the United States for similar action to protect the many animals outdoor cats kill every year. 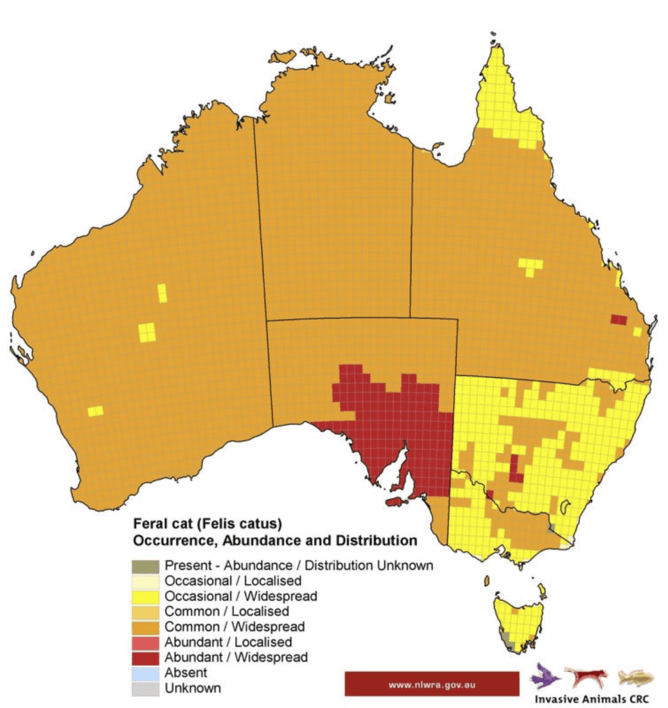 Feral cat map from the Australian Department of the Environment. Canis lupus dingo, Cleland Wildlife Park. Reporter Gregg Borschmann holds a dead feral cat on French Island, Victoria.